Emerging technology of Augmented Reality is propelling the ecommerce industry to widen its horizons and enhance customer experience. Finding its roots in 1970’s, the ecommerce industry has come a long way since then. In today’s digital age, ecommerce is superior to traditional brick-and-mortar retail in several ways that benefit both the retailer and customer. From being a non-existent business model, ecommerce has grown to become one of the fastest growing businesses of the modern era. Emerging technology of Augmented Reality is propelling the ecommerce industry to widen its horizons and enhance customer experience. Ecommerce has rapidly taken over as customers’ preferred way to shop by rising above all the challenges and limitations of the online space. The last decade witnessed a considerable rise in consumer’s interest and overall participation level. As per Statista, ecommerce sales in the year of 2017 amounted to 2.3 trillion US dollars. This number is projected to grow up to 4.88 trillion US dollars till the year 2021. In a matter of time, ecommerce has transformed into the pinnacle of modern-day retailing and is continuously expanding in new directions under the light of Augmented Reality technology. Ecommerce industry has experienced a massive tide of good fortunes by leveraging the potential of Augmented Reality (AR) technology. This move has succeeded to overcome the shortcomings of online shopping by bridging the gap between offline and online shopping experiences. The major concern of online shoppers is ‘uncertainty’. They are usually unsure of whether a particular product is right for them or perfectly meets their specifications. Not all customers have the imagination power to correlate the products available online with the real world space. This is where Augmented Reality technology helps! With AR-based ecommerce app, customers are more confident in their purchases and feel that they are making the right choice. Customers like the idea of being able to virtually try different options before making the purchase decision. AR-based ecommerce app makes this possible by transforming user’s smartphone into a useful and ubiquitous AR platform. 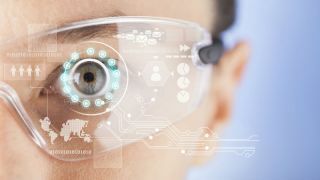 Forecasting the rising need of AR-based mobile apps in the near future, technology giants Apple and Google have developed their own Augmented Reality platforms. These platforms make it simple for developers to build ecommerce apps possessing AR features. iOS developers can breathe a sigh of relief with the availability of ARKit – a platform to build Augmented Reality iOS apps. This kit reduces effort and time of developers in building apps that seamlessly blend digital objects and information with the real-world environment. ARCore is a software development kit for Android developers to build innovative apps with Augmented Reality capabilities. This kit contains all the tools that developers need to make bigger and better bets with AR that perfectly blend the virtual and real world. This is retailer’s first ARKit app that brings furniture objects out of the screen and places them in the real space. This Augmented Reality ecommerce app allows interaction of virtual products with the real world in entirely new ways, which was unimaginable till then. The highlight of IKEA app is that it allows users to bring furniture products home, before they actually buy it. Swedish home goods giant - IKEA was among the early adopters of AR technology. This home furnishing company took a stride in the technology world to improve the online shopping experience. Users can now scan an empty piece of floor through iPhone or iPad’s camera and place the selected product there. This gives users a real look and feel of the object in real world environment and helps them to make an informed buying decision. eBay - a multinational ecommerce corporation has recently come up with an AR based app for Android users. Developed using ARCore, this app enhances the buying and selling experience of customers by offering the next level of convenience to customers through ‘AR box picker’ feature. This feature of eBay allows users to get the right estimate of the size of box for packaging the selected item. AR powered eBay app superimposes a packaging box from its collection of standard box sizes — small, medium top loading, medium side loading, large top loading and many more. This allows users to know what type and size of box perfectly fits the item and helps in purchasing the right box. Online fashion retailer Banana Flame associated with software company Zugara to build an Augmented Reality shopping app that allows people to virtually 'try on' clothes while they shop online. This step is taken after analysing the situation that majority of customers drop the idea of purchasing clothes because they are not able to actually try it. ‘How good would a particular item look like when I actually wear it?’ is the major issue faced by online shoppers. Banana Flame resolved this problem by integrating AR feature that adds a virtual fitting room for customers to try out clothes using webcam of computer. This app uses virtual controls to adjust dresses’ position, size, colour and even allow users to capture a photograph for sharing with friends and get their reviews before purchase. This AR-based shopping app of Banana Flame increased the conversion rate of visitors to customers by 182 per cent in a year. Several beauty brands have started leveraging the power of this emerging technology for improving overall sales figures. Sephora virtual artist is one such example that allows customers to virtually see how makeup looks on face before purchasing the beauty product. Shoppers can take a picture of their face and upload it to the website or mobile app. This allows shoppers to virtually try different makeup products on their face and get an idea of whether it suits them or not. This app also offers tutorials on how to apply eyeliner or lipstick uniquely, all of which are portrayed on your face. Such personalised experiences instil a factor of trust and results in improved conversion rates. Amazon, an electronic commerce and cloud computing company has added ‘AR View’ feature in its application for ease of shopping. As of now, Amazon offers AR view feature for selected number of products. However, company has plans to keep adding more and more products in this list so that shoppers can test the look and feel of it. Product can be rotated to know how large it is and how it looks like when placed in the actual location. AR view feature of Amazon app has improved shopping experience by giving customers a sense of satisfaction and winning their confidence while placing the order. In the light of Augmented Reality, the dynamic ecommerce market seems to be growing aggressively. This technology is adding a new feel to the customer experience by transforming monotonous browsing to an engaging and immersive shopping experience. This is the rise of omnichannel shopping in true sense. Online shopping goes beyond to browsing through images and videos of models walking the ramp by bringing product to life in a 3D immersive environment. Such experiences have changed buyer’s perception by transforming the way purchase decisions are made. Ecommerce brands that have implemented AR feature in their app or website have noticed a significant decrease in number of return requests. When there is no guesswork, customers are quite sure about their purchase. This leaves little to no scope of returning the purchased items. Retail industry is concentrating all the effort in delivering compelling and more inspiring customer experiences. In this endeavour, retailers are focusing on a new concept of Extended Reality (XR), which is an amalgamation of physical and virtual worlds that has the power to fundamentally change the way we shop online. Extended Reality (XR) is a continued version of Virtual Reality, Augmented Reality and other disruptive technologies that help in engaging customers at deeper levels. Ecommerce companies are pioneering to build new applications using Extended Reality. This technology has introduced a sensory mix through haptic technology. To give an example of kind of experience delivered by XR, imagine a customer shopping for a wrist watch and being able to feel and touch the product while trying it on virtually. XR is quickly becoming a viable option to redefine the customer experience through XR-commerce. It has provided better purchase opportunities by connecting immersive experiences with direct product interactions. The role of Artificial Intelligence becomes more impactful when combined with AR and VR to deliver personalised customer experiences. In the presence of AI technology, virtual environment becomes more intelligent and personal and customers in making informed purchasing decisions. Ecommerce marketers can take off with AI-driven salespersons that understand the needs and preferences of customers and shows relevant suggestions. Running an ecommerce store requires keeping track of several elements including inventory, warehouse and supply chain management. IoT helps in optimising inventory management with the use of sensors and RFID tags that streamline the entire flow of operations. IoT helps in establishing an uninterrupted and efficient supply chain to carry out operations of e-commerce businesses successfully. IoT ecosystem of ecommerce store enables tracking of goods right from the production stage to its final delivery. RFID and GPS technology keep a track of all the items in transit. It is possible to get complete information about the location of product, manage the route and speed of the shipped products and accordingly predict the arrival time periods. AR is the future of omnichannel experience. This technology leverages the perk of online shopping, such as convenience, and overcomes the challenge of ‘uncertainty’ to deliver impactful results for ecommerce business. AR allows customers to interact with the product in real time and deliver ‘touch-and-feel’ experience similar to that of in-store shopping. By eliminating the guesswork from online shopping, AR technology has reduced company losses resulting from return requests of customers. These pain points are addressed with innovation in ecommerce. AR is truly a market differentiator and several ecommerce brands are betting big on ‘Extended Reality’ and ‘Augmented Commerce’.